This site is called The College Investor and one of my favorite sandwiches in college was A Wreck® at Potbelly’s with those truly amazing hot peppers. I just could never get enough. Investors can’t get enough either. Potbelly (NASDAQ: PBPB) had its IPO last Friday and investor demand bordered on insatiable. The shares were up 120% in the first day of trading. It is up about 7% today to almost $33 per share. Prior to Potbelly, only eight other stocks doubled in their first days of trading since 2001. The company sold 7.5 million shares at $14 per share and raised $105 million in capital. Investors are excited by the Potbelly’s growth prospects. There are significant opportunities to expand the company’s geographic footprint and grow earnings, all of which could be positive for shareholders. Potbelly might be another Chipotle — buyers of the shares seem to think so. Potbelly started in Chicago, IL in 1977 and was born into its current form in 1996 when Bryant Keil bought the original store. Over time, Keil built over 280 locations throughout concentrated regions in the United States. Just for scale, Chipotle had over 1,230 stores at the end of 2011 and even more now. Potbelly’s presence is still focused in Illinois with stores scattered through other states. There is room to expand further in current areas but especially in the West. There are no locations in California, for example. Management stated it will use the proceeds to pay a dividend to the shareholder prior to the IPO of $49.9 million. It will also use the cash it raised to repay borrowings from its credit facility. Some funds could also go to general corporate expenses and to fund the company’s working capital needs. Potbelly has had steady sales growth over the past three years, up by 15.5% in FY12 and 7.9% in FY11. Through the second quarter of this year, sales were up 11.7%. Growth in the low-to-mid teens is solid in the quick-serve restaurant industry and should accelerate behind new store openings. Store level margins fluctuated a bit around the 21% level for Potbelly over the last three years. EBITDA margins were generally over 11% over this time period. That said, margins have been tight, the operating margin was just 3.1% last fiscal year and was 3.4% in the prior year. New store growth will drive sales and earnings growth over next five years. Potbelly has significantly increased its capital spend to open new stores since 2010. The following chart shows the large jump. Also through the first half of 2012, Potbelly spent over $16 million in capex. The stock is not cheap at current levels but investors will typically pay for growth. The shares currently trade around 35x earnings and at over 3x revenues. That said, Chipotle Mexican Grill (NYSE: CMG) trades at 45.7x earnings, Jack in the Box (NASDAQ: JACK) at 24.7x, Denny’s (NASDAQ: DENN) at 23.2x, and Domino’s Pizza (NYSE: DPZ) at 30.5x. Taking a look at these more mature restaurant chains indicates the valuation is not out of line. The stock might be cheap versus future earnings if it continues to invest in new stores. It’s a lot easier to double locations — and sales — when you have 280 locations versus thousands of locations. The concern with Potbelly is somewhat low same-store sales growth and its low margins. However, new locations are much more critical than same-store sales at this point in the company’s growth cycle. In addition, store level margins of around 21% are decent, and it will better absorb the remaining overhead with new locations and increased volume. There a few events to pay attention to with Potbelly. The first is the upcoming 3Q13 earnings report and management commentary at that time. The second is analyst coverage. Currently it has no coverage because of its small market cap but more so because it is a recent IPO. Analysts’ initial earnings forecast and opinions on the stock will play a critical role on how the stock performs in the remainder of the year. A great time to buy the shares of restaurants or retailers is in the relatively early phase of taking a regional firm national. This is typically the highest growth phase for earnings and the stock often increases rapidly along with them. The Potbelly brand has stood up over time and it has a secure foundation at the current point. Its store model, brand, and food resonates with consumers otherwise it would not have 280 stores. Now it’s just a matter of making the brand available to more consumers through store growth. 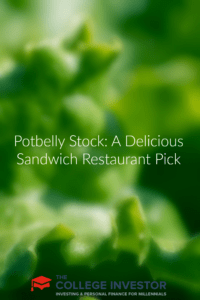 Potbelly is worth paying attention to and investing in for your portfolio. What are your thoughts on Potbelly? Food in general can be a good investment particularly in a down economy. I tried to get in on the IPO!